San Francisco: This is a station wagon on 'roids. The 2007 Dodge Magnum combines a muscular shape with up to 425 horsepower to create one of the wildest grocery-getters on the road. With a quiet, roomy interior it makes the Magnum feel as comfortable as a traditional family car, despite its outlandish styling. And it has the look and practicality of an SUV without any of the drawbacks. There are plenty of adrenaline-pumping cars for sale. Behind the wheel of a Corvette or a Porsche, you could turn the most boring economics professor into a tire-smoking, redline-kissing lunatic in no time. Most exciting cars have one of two problems, though. They're either too impractical or too expensive. While you can get a 'Vette for about the same price as a well-equipped, full-size SUV, you can't use the sports car to haul lumber or take the family to the Grand Canyon. It only has two seats. You can get a tad more practicality from, say, a BMW M5 or a Porsche Cayenne Turbo, but cars like those cost so much that only corporate bandits can afford to buy them. They're not worth spending the rest of your life in jail with Jeff Skilling and a tattooed man named Gus. In fact, the only affordable car that offers hair-raising excitement and SUV-like practicality is Dodge's muscle wagon, the Magnum. This is a car that was born in the wrong era. It's a huge, hulking block of American metal that would have been perfectly at home in the horsepower-crazed 1960s, a time when cars were shaped like slabs of beef and fitted with gasoline-swigging engines that were better suited for cruise ships than automobiles. The Magnum is just like that, only with a little bit more technology. It's available with a V6 engine, but it's much better with a big, 340-horsepower Hemi V8 in keeping with its muscular look. With the Hemi, you can stomp on the accelerator and let the rear wheels spin as long as you'd like, making the tires disappear into a cloud of burned rubber. The sound of the engine alone is enough to make kids wet themselves and have nightmares until they're 16. Yes, this car is exciting. And it's not just about driving fast in a straight line. The chassis is so firm, the suspension so delicately tuned, that you can easily steer it with the throttle while going around corners, giving it just enough gas to swing the back end around like in the cool car commercials. It feels like a true sports car should, only bigger and heavier. When it comes to the cabin, though, the Magnum is actually set up more like an SUV than a car. The back seat can be folded down to create a cargo space that seems bigger than the Superdome, and the seats are recliner-like, roomy and high, more like you'd expect to find in a big truck than in a typical station wagon. Pricing starts under $24,000 for a basic V6 Magnum. To get a Hemi engine, you have to buy the R/T model for around $31,000, which also includes leather seats, an automatic transmission, an upgraded stereo, and, not by any accident, a bigger gas tank. The 5.7-liter Hemi gets just 17 miles per gallon in town and 25 on the highway, and that's with technology that automatically shuts down some of the cylinders when they're not needed. It's not awful gas mileage for such a huge powerplant, but it's certainly no Greenpeace award winner, either. For even faster fun, there's the high-performance SRT8, which has a bigger, 6.1-liter Hemi V8 that makes 425 horsepower. It also comes with a lot of upgrades, including 20-inch wheels, and retails for close to $38,000. All those prices aren't bad for big vehicles that haul as much cargo as the Magnum. And they're especially impressive considering what else the Magnum hauls, like ***, think donkey�..
What was tested? 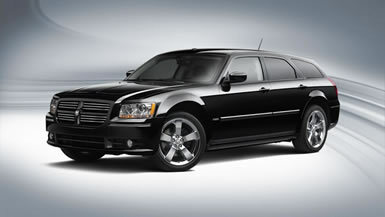 The 2007 Dodge Magnum R/T with a base price of $30,545. Price as tested: $30,545. Why avoid it? It's not nearly as cool without the pricey Hemi.